Looking for an elegant party theme for a Girl's Birthday Tea, Baby Shower, or Bridal Tea for that special lady in your life? Well, look no further! Show that special person lots of love with a Tea Par-TEA! This theme is so girly, beautiful and fun, and it's perfect for ages 2 to 100! One fun activity to have at a girls party is a flower crown making station! I did this at a recent party and it was a hit! This is the perfect sign to display at your floral crown making station at your baby shower, bridal shower, or girls birthday party! This 5" x 7" printable digital 'Make a Floral Crown" sign is available via instant download and can be printed on your home printer or a professional printer. One 5" x 7" printable sign comes on one 8.5" x 11" sheet via Etsy Instant Download! 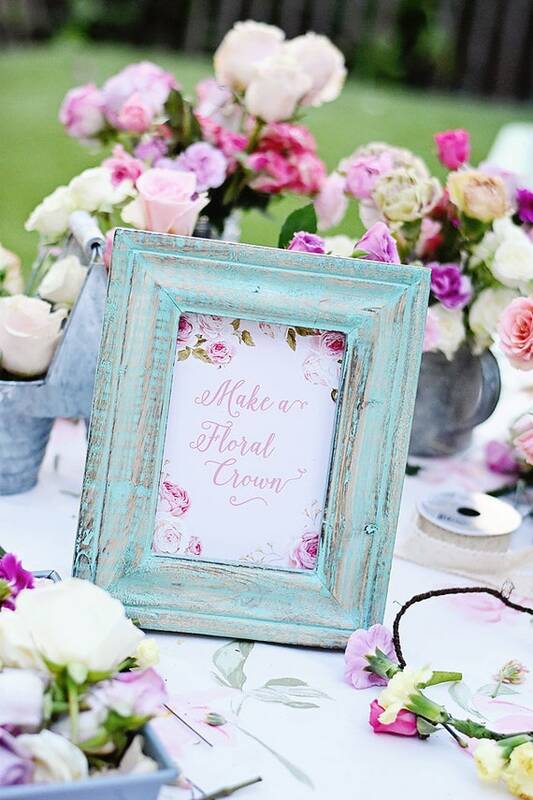 This sign features gorgeous pink watercolor flowers for that shabby chic look! This sign is not editable. If you'd like a custom sign, please convo me before purchase so that I can set up a custom listing for you. ***NO printed material will be shipped - you will need to print/cut out the file yourself on a home computer printer or other printer like Staples, FedEx Office, etc. Please let me know if you have any questions! Thanks for shopping my Tea Par-TEA Printables! Matching Tea Par-TEA printables are also available in the shop! If you are posting pictures of your event to social media, please tag my instagram account @entertainingwithemily! I'd love to see your work! Bunny Party, Carrot and Vegetable Food Name Table Tents cards, blank, INSTANT DIGITAL DOWNLOAD Printable Pdf, 2 designs, 3.5" x 5"